Revealed and already available for order via the Tamashii Web Shop is yet another entry into Bandai’s recent Kikaider subline of S.H. Figuarts! 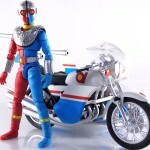 The personal ride of Kikaider 01, the S.H. Figuarts Double Machine is a successor to the original Kikaiders Side Machine. A rather fantastic design, though most definitely one straight out of the 70’s, the Double Machine will fit right in with your growing Kikaider collection. It’ll most certainly fit in with mine! 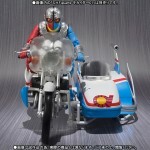 It looks like the only included accessories this go around will be a repeat of the last 2 Kikaider themed vehicles, spare handle bars and a set of optional licensed decals! S.H. Figuarts Double Machine will be released in September for 7560 yen via the Tamashii Web Shop. Get with your web exclusive middleman to secure a pre-order today! The Tamashii Nations Akiba Showroom has just updated it’s display cases with some upcoming retail & exclusive figures! Are you as excited for these upcoming releases as we are? Be sure to share your thoughts in the thread linked ot this story! S.H. Figuarts Kikaider 01 In Hand Images, Gil Hakaider Revealed! Well ahead of it’s April release via the Tamashii Web Shop we’ve gotten an early in hand look at S.H. 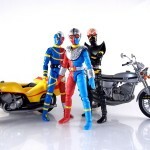 Figuarts Kikaider 01! As usual this type of early look is courtesy of Tamashii Nations themselves and it gives us a glimpse at what the finalized figure will look like, and the accessories it will have. However, these images also drop a huge bomb. The reveal of S.H. Figuarts Gil Hakaider! Fans of the Kikaider franchise will undoubtedly recognize the emperor of the DARK & SHADOW terrorist organizations as he appeared in Kikaider 01. Gil comes with what every evil emperor needs, a flowing cape and his trademark staff! No release details are known for Gil Hakaider yet but stay tuned as we find out more about this surprise reveal! Revealed earlier this week among several other new figures, the Tamashii Web Shop has updated with official images and pricing info for the upcoming S.H. Figuarts Kikaider 01! The younger brother of Jiro the original Kikaider, Kikaider 01 (Ichiro) was likewise the star of his own live action series in the 70’s. Itself a follow up to the original Kikaider show. At the rate Bandai continues to pump out new Kikaider Figuarts we may run the gamut of the two classic live action shows pretty quickly. Perhaps some figures based on the Reboot film or the anime & OVA’s are down the road? S.H. Figuarts Kikaider 01, much like his brother, only includes 3 extra sets of hands for accessories. But this classic addition to your collection will be made available as a Tamashii Web Exclusive in April 2015 for 5184 yen. 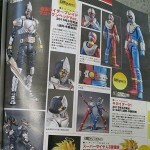 Another set of magazine scans is still making the rounds tonight and we’ve got a couple of more figure confirmations. First up is the next release in the Kikaider series of Figuarts. It’s Jiro’s brother Ichiro, S.H. 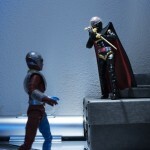 Figuarts Kikaider 01! Kikaider 01 looks to be a pretty standard release much like the recently released Kikaider. Like his brother, Kikaider 01 will also be a Tamashii Web Exclusive set for April 2015 for 5184 yen. Next up is an odd one that’s sure to please Kamen Rider Blade fans. The elusive and popular S.H. 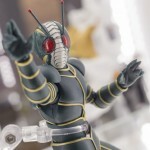 Figuarts Kamen Rider Blade is getting a reissue, with a twist! This Blade will be released as a battle damaged Broken Head Version! It will include a damaged helmet with a partially revealed face of our hero Kazuma Kenzaki! A Tamashii Web Exclusive S.H. Figuarts Blade Broken Version will be out in April 2015 for 4320 yen.